For years the community known as Puerto Peñasco to the Mexicans has been called Rocky Point by theAmericans. Rocky Point in Spanish would be Punta (not Puerto) Peñasco. Why the discrepancy? Actually the name goes back much farther than we might suppose, considering the town was first settled only in the 1920’s. It was 1826 that retired Lt. Robert William Hale Hardy of the British Royal Fleet was sailing along the coasts of Sonora and Baja California searching for pearls and precious metals in the sailing ship La Bruja (the witch). He baptized the point Rocky Point and it was identified as Rocky Point on marine maps until General Lázaro Cárdenas (who was to become president of Mexico in the 1930’s) changed it to Puerto Punta Peñasco (Port Rocky Point). Americans dropped the Port, and Mexicans the Punta. During the early 1920’s Americans traveled from Tucson, Phoenix, Gila Bend and Ajo to fish for the enormous flying fish abundant in the nearby waters. For the wandering fisherman who traveled from Guaymas to the gulf of Santa Clara del Colorado, Rocky Point provided the ideal place for refuge from storms, thanks to the hill of volcanic origin, which the fishermen knew as “the hill of the whale”, and the beautiful and tranquil estuary. However the sight did not offer the essential element they needed: water. During Prohibition there sprang up along the border bars, clubs, hotels, and casinos, which offered thirsty Americans beer and liquor and, in some cases, women and gambling as well. Then John Stone, who owned the Hotel Cornelia in Ajo, decided to build a hotel-casino farther south, near the sea, to combine the money-making potential of fishing with that of alcohol. He dug a well for potable water 20 kilometers from the coast and recruited a number of fisherman who were willing to risk living in harsh conditions. So was born the town of Puerto Peñasco. John Stone installed roulette, cards and dice tables. He also sold water which he imported from his well. More surprising, perhaps, he established an airline, Scenic Airlines, with direct flights to Phoenix and Tucson. The site was nearer what is now downtown Puerto Peñasco than the present airport. It is no longer in use and homes have been built on the land. The fishermen who settled the town in the 1920’s were left in dire straits when John Stone, a local hotel keeper, had a falling out with them and left town, burnong the Stone Hotel and blowing up the only well with drinking water for miles around. After that the townspeople had to depend on water carried by truck from Sonoyta, which was expensive and in short supply. One day in 1936 , when the fishermen were sinking under the midday heat, when even the flies didn’t have strength to move, there arrived in the village three automobiles. From one of the vehicles stepped out General Lázaro Cárdenas, president of the Republic. The General saw a sad spectacle, men and women who appeared to be alive only through a miracle, living in caves, in tents, out in the open, unkempt and virtually without clothing. Tears came to his eyes. What they had said in the country was true. 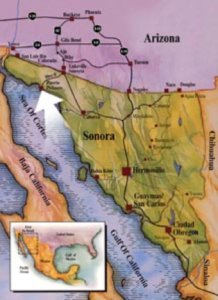 The committee went out to a hill, and from there, the president began to plan an enormous wharf where cargo vessels would tie up, a railroad that would unify Baja California with the rest of the country, and a highway to the United States. Simultaneously in Puerto Peñasco the wharf began operations, the well and the old Stone Hotel were rehabilitated and the urban development of the port was begun. The importance of Puerto Peñasco owed much to the railroad, which created other sources of work, such as industrial shops and new hotels – among them the Hotel Mexico, the Hotel Miramar and luxurious Hotel Cortez. The last named was constructed of material from the US, supposedly as a result of a meeting between Presidents Theodore Roosevelt and Lázaro Cárdenas of Mexico. $1 USD =18.78 MEX Pesos. $1 CAD =14.03 MEX Pesos. $1 EUR =21.12 MEX Pesos. On hot days, our On-The-Beach location enjoys temperatures that are usually 15 -20 degrees cooler than indicated in the weather forecast. During the winter, it is from 5 to 15 degrees warmer than what is forecasted. Located on the shores of the Sea of Cortez on five miles of sandy beach known as Las Conchas. 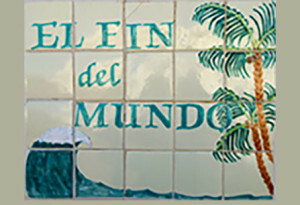 El Fin del Mundo is the perfect setting for watching refreshing sunrises and spectacular romantic sunsets on the same horizon. © 2017 Stone Development, LLC All Rights Reserved | Developed and Maintained by Applied Marketing Systems, Inc.